In more recent times, research has confirmed this traditional wisdom. There are now many published clinical studies demonstrating the ability of a range of herbs to support the endocrine system by supporting the body’s ability to cope with fatigue. AdrenoBoost is a 100% safe, non-addictive, natural herbal remedy. AdrenoBoost can be used consistently for adrenal support and to maintain systemic balance in the endocrine system and healthy cortisol hormone levels. AdrenoBoost contains a selection of herbs known for their supportive function in maintaining hormonal balance. 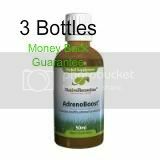 AdrenoBoost provides adrenal support thereby helping to maintain balanced metabolism, energy levels, sleep patterns, and routine, healthy performance of the immune system. How has AdrenoBoost helped others? —James F., 52 years old. Borage (Borago officinalis) is an herb with a variety of uses, including significant tonic benefits. Studies confirm the benefits of borage on systemic performance. (Mills, D. E., Prkachin, K. M., Harvey, K. A., and Ward, R. P. “Dietary fatty acid supplementation alters stress reactivity and performance in man”. J Hum.Hypertens. 1989;3(2):111-116). Siberian ginseng (Eleutherococcus senticosis) contains ginsenoides which support blood flow to all organs of the body. In oriental medicine, Ginseng is highly respected and prized as an herb which maintains energy levels and healthy circulation, supports natural vitality and acts as an overall systemic supporter. It is a supportive tonic for healthy adrenal function. In a recent study Siberian ginseng was shown to support stamina and fitness. (Szolomicki J, Samochowiec L, Wojcicki J, Drozdzik M, Szolomicki S. “The influence of active components of Eleutherococcus senticosus on cellular defense and physical fitness in man”. Phytother Res. 2000 Feb; 14(1): 30-5). Huang Qi (Astragalus membranaceoushas) been used in traditional Chinese medicine for many centuries as a natural rejuvenating tonic. Currently, much of the pharmacological research on Astragalus is focused on its immuno-supportive polysaccharides and other active ingredients useful in supporting a healthy immune system. (Wang DC. “Influence of Astragalus membranaceus (AM) polysaccharide FB on immunologic function of human periphery blood lymphocyte”. Zhonghua Zhong Liu Za Zhi 1989;11:180-183). The main constituents of Astragalus membranaceus include polysaccharides, saponins, flavonoids and amino acids. (Bombardelli E, Pozzi R. “Polysaccharides with immunomodulating properties from Astragalus membranaceus and pharmaceutical compositions containing them”. Eur pat 441278 A1;1994). (Lin LZ, He XG, Lindenmaier M, et al. “Liquid chromatography-electrospray ionization mass spectrometry study of the flavonoids of the roots of Astragalus mongholicus and A. membranaceus”. J Chromatogr A 2000;876:87-95). (Sun Y, Hersh E, Lee SL, McLaughlin M, Loo T, Mavligit G. “Preliminary observations on the effects of the Chinese medicinal herbs Astragalus membranaceus and Ligustrum lucidum on lymphocyte blastogenic responses”. J Biol Response Mod . 1983;2:227-237). Do not use within 4 hours of bedtime. Safety during pregnancy and breastfeeding has not been established. Results may vary, due to a number of influential factors. Over time (usually 3-6 weeks) AdrenoBoost will act in a supportive capacity to healthy adrenal glands and support a healthy endocrine system, and cortisol levels with some individuals responding sooner than others. Best results are achieved when AdrenoBoost is used consistently. One bottle of AdrenoBoost at full adult dosage (15 drops three times daily) will last approximately 30 days.